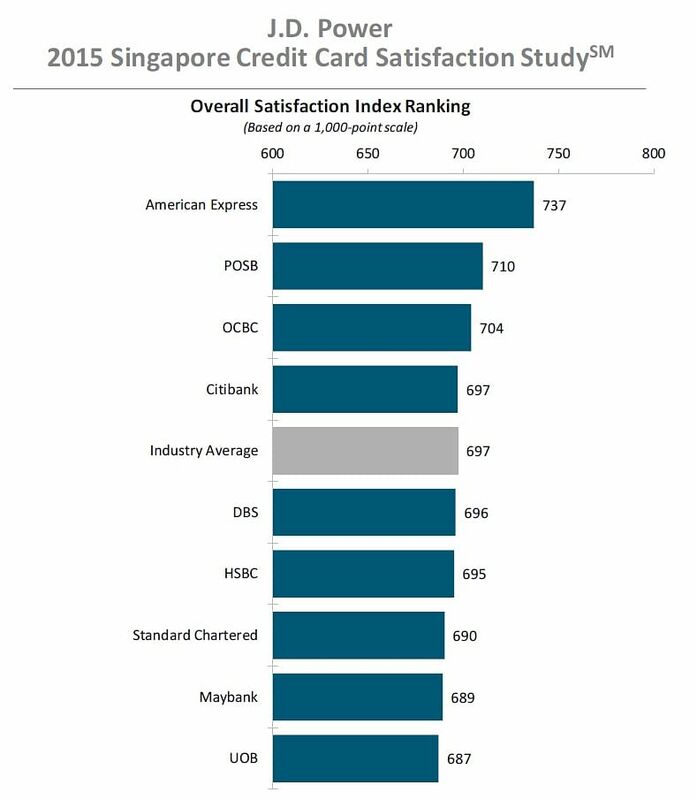 SINGAPORE - If you own an American Express credit card here, chances are you're a happy customer. Amex topped a credit card satisfaction survey conducted by global market research firm JD Power, which gathered responses from 2,849 customers in Singapore throughout August and September. The survey, the company's first such here, was modelled on similar studies it has conducted for nearly a decade in the US. The survey measured customer satisfaction with their credit card issuer in six areas: interaction; credit card terms; billing and payment; rewards; benefits and services; and problem resolution. Satisfaction is calculated on a 1,000-point scale. The survey also found that few credit card customers fully understand important terms of usage, such as foreign currency and transaction fees, interest rates and annual fees. Those who do, spend on average $1,068 monthly on their card, compared with $837 for those who either do not or only partially understand their card's terms. "In a highly saturated credit card market like Singapore, it is important for card issuers to not only promote the rewards and benefits of their product, but also to ensure that relevant information on interest rates and other fees and charges are clearly outlined," said Dr Gordon Shields, director at JD Power. "Customers with a greater understanding of their credit card terms are also more satisfied overall and, thereby, tend to spend more on their primary card." The survey also found that given the multitude of reward programme offerings, customers often do not understand how to earn and redeem rewards on their cards. Only 32 per cent of cardholders say they "completely" understand how to earn rewards, and only 47 per cent are fully conversant on how to redeem them. "Issuers that can de-clutter their offerings and hone in on the key winning propositions, will likely benefit in this market," said Dr Shields. Three banks topped the survey in educating their cardholders on their reward programmes: HSBC, Standard Chartered and OCBC, in that order. And what reward do pragmatic Singapore cardholders prefer most? The cashback - although hotel stays, airline tickets and access to special events and experiences excite them more, the survey found. Least preferred reward? It's a toss up between making a donation and getting something for free like a vacuum cleaner.